Purchase two Sunlight Vitra Panton Chairs or two All Plastic Chairs between 01.04. and 31.08.2017 and receive a Classic Tray and Paper Napkins as our gift to you. The complementary items will be automatically added to your shopping basket. Please click on the picture to download the brochure (PDF, ca. 4,2 MB). 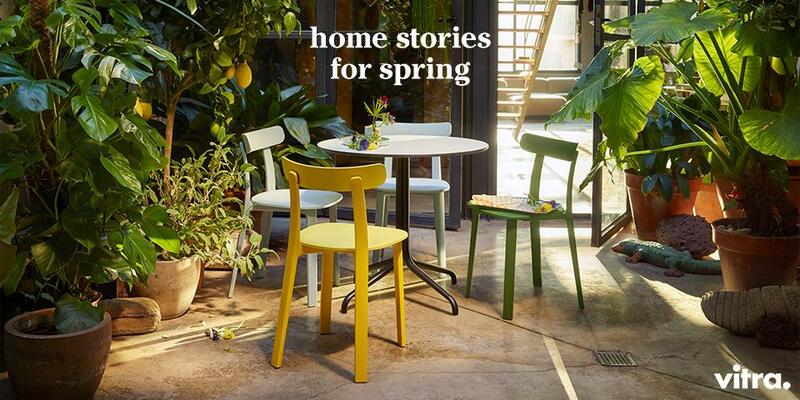 From kitchen gardens and living room plants to backyard jungles ... With their "Home Stories for Spring 2017" Vitra take us into a world of furnishings conquered by nature. Unique collages of furniture, plants and accessories seduce into the warmth, comfort and ease of spring, summer and nature. Browse the brochure, get inspired and create your own personal #SecretGarden.